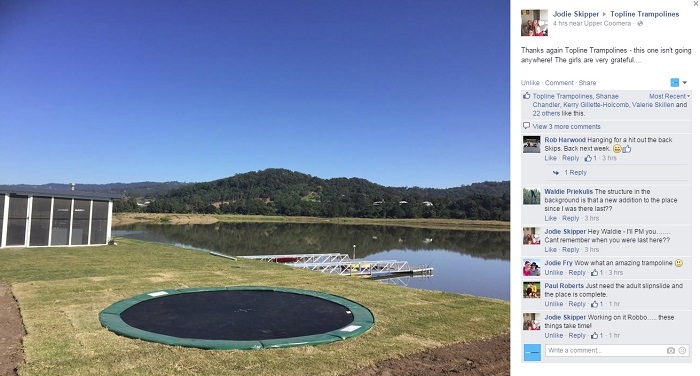 We just love when our customers are delighted with their trampolines! A recent customer lost her trampoline in some terrible windy weather. To avoid this happening again, the steps were taken to install an in ground trampoline. Not only does the yard look tidy – the trampoline is safe for the kids and won’t be blowing away anytime soon. And with a great view – this backyard is ready for summer! Perfect for all those summertime BBQs and of course Xmas! All Christmas orders must be placed and paid in the coming months, to be dispatched by 20th November for on time Santa Delivery! Check out the in-ground trampolines or full range of trampolines we have if you are considering making your backyard look like this.